CONDLIFFE, G.E., Brit. Pat. 47503Z. This of course is exactly the principle of the flying spot telecine film scanners. BAKER, H.W., and KEMP, W.D. B.B.C. Quarterly, Winter 1949-50. KEMP, W.D. Proc.I.E.E., Vol. 99, Part IIIA, No. 17 1952. The use of continuously-moving film to record two consecutive television frames in one film frame seems more feasible when it is remembered that the television picture is not a continuous presentation of light from all parts of the field, as is the case when viewing a natural scene. The television display is made one point at a time in ordered sequence over the picture area and persistence of vision deceives the eye of the viewer into the belief that the whole picture is continous. The recording camera, however, suffers no such deception, and at any given instant sees only a single spot with the rest of the field black, if the tube is assumed to have no appreciable after-glow. The scanning motion of the television spot is such that in recording the horizontal lines of the raster it also moves steadily downwards in the frame direction, flies back upon completion of a frame scan and then begins again in the downward direction for the interlaced scan. When the television display is imaged on to a recording film it will be seen that this motion of the scanning spot has properties which can be utilised as an alternative to the quick-pulldown mechanism. Provided the relative velocities of film and scanning spot are correctly arranged in the continuous-motion camera, every point in the film frame will, in turn, be given a very short exposure as the spot traces over the corresponding point in the television picture. Each exposed point in the film will receive no other light at all since the rest of the picture is black; and thus although the film is moving continuously, a clear image is recorded free from the vertical smudging which would occur if such a camera were used to photograph a natural scene. The correct arrangement of the relative velocities of film and scanning spot is best illustrated by reference to the basic continuous-motion recording system  which uses a 25 c/s frame deflection on the display tube. This of course gives a display of two television images one above the other; an odd and an even frame. The amplitude of this frame deflection is, however, such that each of the television images is only half normal height although of normal width, making a 4:3 display of two images each 4: 1½. This special display is then imaged by an ordinary lens on to a continuously-moving film, the direction of film travel being such that the scanning spot sweeps against the flow of film. The recording cycle starts as the scanning spot passes through the mid-line of the display and begins to write the lower of the two television images. The inverted image of the scanning spot travels upwards over the film for 1/50 sec. and the film itself travels downwards by one-half a frame height in the same period; the relative movement of spot and film is thus one whole frame and the correct aspect ratio is restored on the film, since the display was deliberately distorted to half the normal height. On reaching the bottom of the scan, the scanning spot then flies back to the top of the two-picture display and its image, rapidly overtaking the moving film, catches up the first line of the exposed frame and then proceeds to record the interlaced frame between the lines already exposed on the film. The cycle recommences as the scanning spot again passes the mid-lines of the display and its image passes on into the next film frame. This system, which is simple and straightforward from the optical point of view, is of great interest because it shows the fundamental requirement for the motion of the image of the scanning spot when using continuous-motion film traction. The spot must, by some means or other, be made to trace the path of a 25 c/s sawtooth against the flow of film. Other continuous-motion systems are merely variations on this theme. 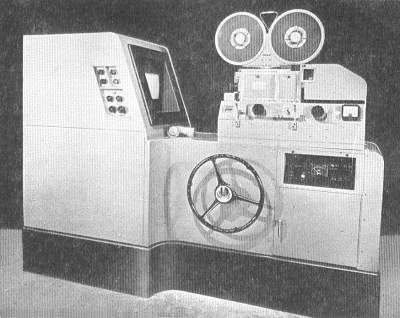 Even the complex Mechau machine  performs no more than the feat of turning the image of a normal television display into the required 25 cycle raster in the film plane. In addition to the continuous-motion systems, intermittent mechanisms with a much longer pulldown than 1.4 milliseconds have been used. Such systems normally must, however, fail to record the whole television information, since scanning proceeds while the camera ceases to record during the pulldown period, but in various ways this loss is disguised . The simplest example of this form of recording system is the Suppressed Frame method in which no attempt is made to record an interlaced picture and the operating cycle is simply to record one 202½-line television frame and pull down the film during the next television frame. This of course gives a 25 frames-per-second film, each frame containing only half the number of lines of the complete television picture, but due to the high degree of correlation which exists between adjacent lines in the normal television picture, the loss of the interlaced frame is not as serious as might at first be expected. Fig. 3 (below) shows a telerecording channel of this type.